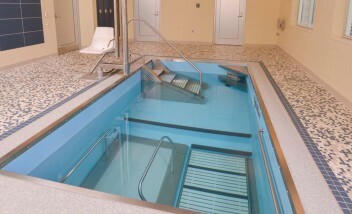 The HydroWorx® 750 Series™ pool is a radically functional therapy pool. Manufactured with sectional pool walls, this pool can be transferred into existing buildings with ease and flexibility. 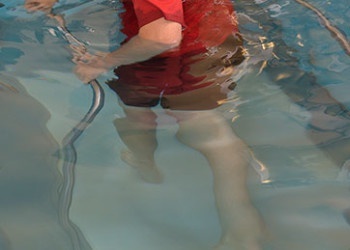 This 8’2″ wide by 14′ long pool includes HydroWorx’s underwater treadmill and resistance therapy jet technology as standard features, providing athletic trainers and physical therapists with advanced aqua therapy tools to give their patients a more advanced recovery. A great replacement for outdated therapy pools, this pool includes our underwater treadmill and resistance jets and optional deep water well. The recommended minimum poolroom dimensions are 14’7” wide by 23’ long. This 8’2” wide x 14’ long pool is designed to accommodate from 1 to 5 people at once. What are the unique performance features of the HydroWorx 750 Series Pool? Designed to give athletes and patients extra depths for unloading, this 7′ deep well area is a great way to accommodate deep water running or taller athletes and patients. The HydroWorx 750 can be installed in-ground or partially in-ground. 13’x 8’2″ water treatment area easily accommodates four to five patients during workouts or therapy sessions. What are a few of the advantages that the HydroWorx 750 technology provides? The video system allows the athletic trainer or physical therapist to diagnose gait patterns, record treatment sessions and document progress. The athlete or patient benefits from being able to see himself or herself on the TV monitor and execute the desired protocol faster, thus speeding up the healing process. The water-resistant hand-held remote controls all functions of the 750 Series with the Technology Package Upgrade. This gives the athletic trainer or physical therapist complete freedom of movement while administering treatment or conditioning sessions. Computer documentation: HydroWorx owns the proprietary rights to the software that was written exclusively for the HydroWorx 750 Series. The software monitors the pool functions, treadmill speed, and jet power and then uses this information to display current session information, and stores the information in a patient database for future reference, and progress reports. Who are a few of your 750 Series customers? 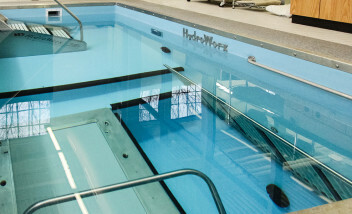 What is an example of how the college and pro sports teams utilize the HydroWorx 750 Series Pool? Additional therapy workspace with variable water depth allows clinicians to treat four patients at the same time, maximizing return on investment.